There was a little bit of debate on the route we should take upon leaving the Mackinac area. I wanted to head down the western side, along the shore of Lake Michigan while Clark was thinking the eastern side would be less crowded (especially since we would be traveling in the midst of the dreaded Summer Vacation period). After consulting with a local, and finding out that this last recession shut down a lot of the campgrounds, restaurants and attractions on the Detroit side of the state, we opted for the more beautiful (aka touristy) side. We knew nothing about Michigan really…so, this entire leg of the journey was entered into blind. Most of our stops were chosen simply due to travel time and not necessarily by location or points of interest. To be honest, the entire shore of Lake Michigan is stunning so I don’t think you can go wrong where ever you decide to drop your jacks. Our first stop had us at Magnus Park in the city of Petoskey. Yes, this is a view from the RV park. I’m going to let you know now, if you want to see the area book a reservation here ASAP. 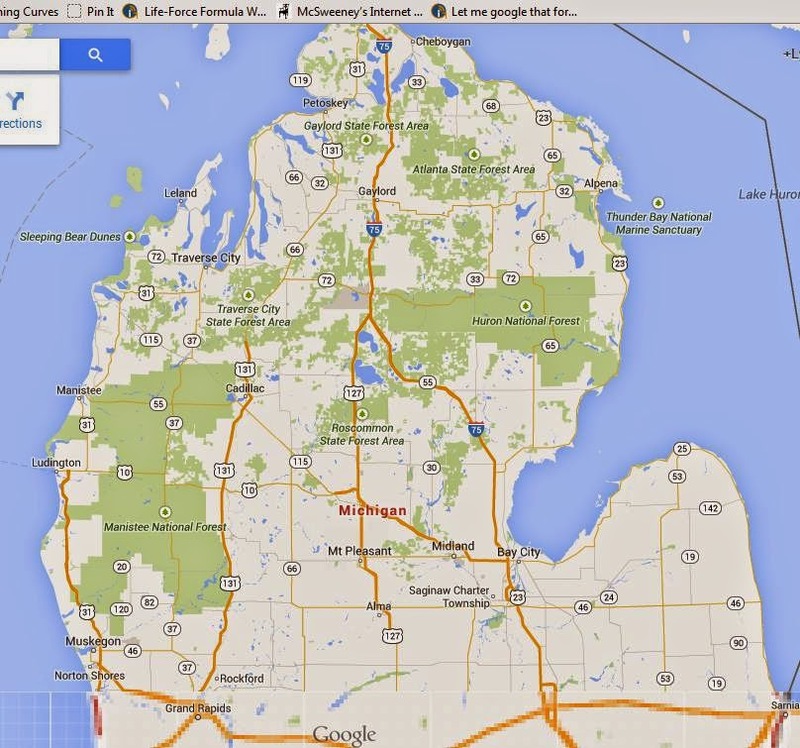 While not the sites aren’t the most private or secluded, they are cheap for Michigan. At $25 per night for full hookups ($23 for water and electric only) you’d be hard pressed to find a better deal. The views are actually really great and the Little Traverse Wheel Way (a 28 mile bike path that passes through several cities) runs right through the park. Wild flowers blooming every where. Unfortunately for us, we failed to make reservations and had only one night in Petoskey, which isn’t nearly enough time to explore. However, great weather combined to a fantastic location made our overnight very enjoyable. Well before dinosaurs roamed the earth, over 350 million years ago during the Devonian period, the land we know as Michigan was located near the equator. Covered by a warm, shallow, saltwater sea, the colonial coral hexagonaria percarinata thrived with other marine life in tropical reefs. The earth’s plates moved and pushed Michigan north to the 45th parallel and above sea level, which created dry land formations. 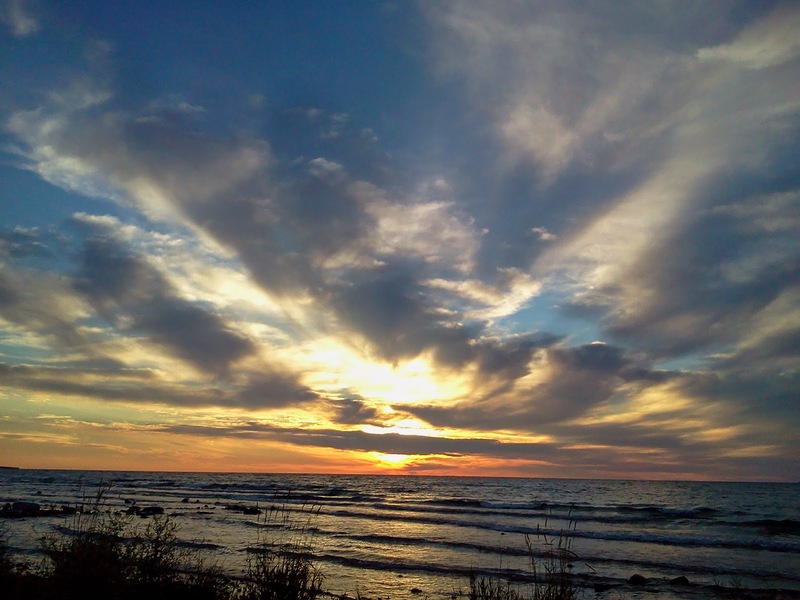 More recently, about two million years ago, glacial action scraped the earth and spread the fossils across the northern Lower Peninsula, depositing major concentrations in the Petoskey area. 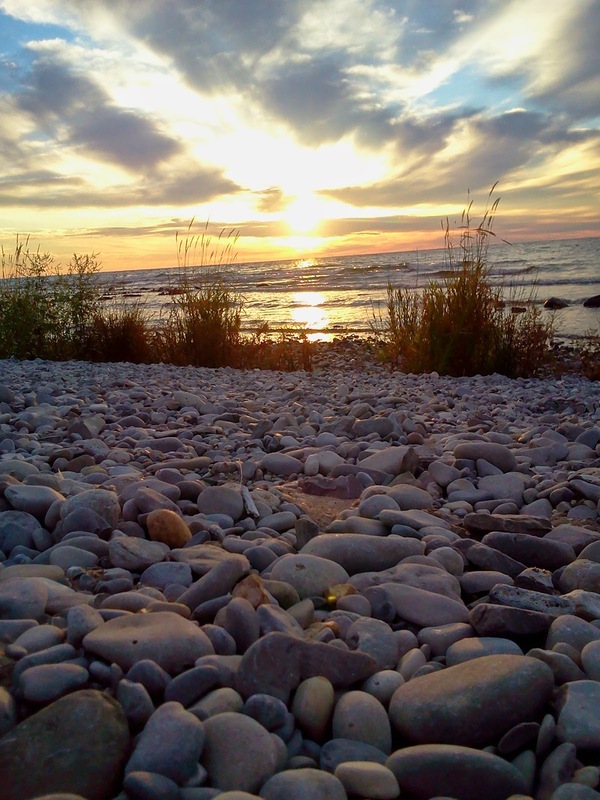 The prehistoric fossil, unique to the Traverse Group rock strata, is called the Petoskey Stone and is Michigan’s official state stone. As you can see, there are a lot of rocks to sift through to find just one Petoskey Stone. Lots and lots of rocks. 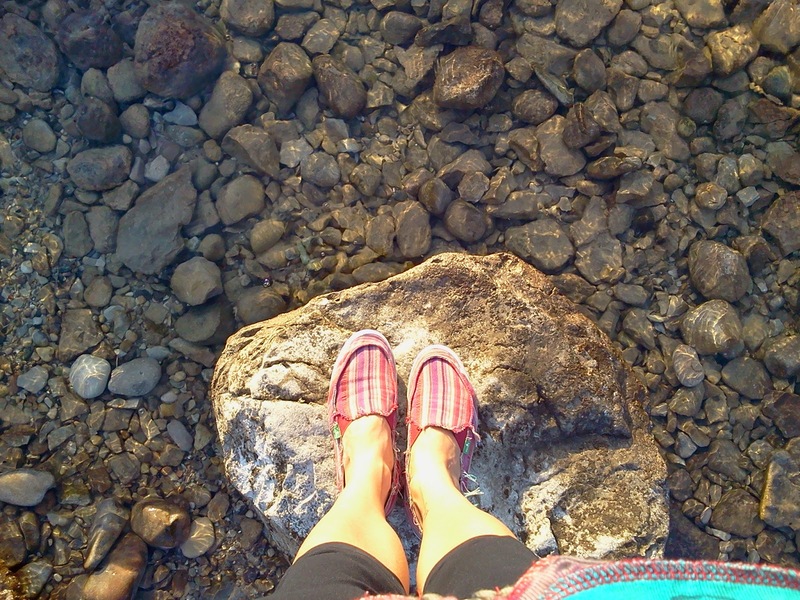 I spent a great deal of time looking through rocks along the shore. Eventually, Clark came looking for me. When I described what I was trying to find he laughed, strolled a few feet, bent down and picked up a rock that turned out to be…a genuine Petoskey Stone. Seriously. Our very own Petoskey Stone!! And since we didn’t want to waste precious time, we took advantage of the long summer days to do a little exploring. Forget the Bear River Valley Recreation Area, the Petoskey State Park, the Mackinac Trail Winery or Gas Light District. Nope…we opted for a short drive to Charlevoix to do a driving tour of the Earl Young Houses. After our experience with House on the Rock in Wisconsin, we’ve been more open to the idea of exploring local architecture. Well, the fact that Clarks’ dad was an real life architect may have some bearing too. But these houses were different. Often referred to as fairytale, gnome, hobbit or mushroom homes it was something we just had to see for ourselves. We were especially intrigued because Earl Young hadn’t studied architecture nor did he have any construction experience. The Mushroom House, complete with “frosted chimney”, built 1951-1952. Influenced by Frank Lloyd Wright’s idea that buildings should respect their surroundings, Young was adamant about not cutting down trees and working with the natural landscape. Although all of the homes in Charlevoix are privately owned, and therefor only viewable from the outside, you can visit the Stafford’s Weathervane Restaurant to get a closeup of Young’s typical designs.